Smart Locks have become an increasingly popular part of smart homes, and have even caught on with homes that have not dabbled too far into automation. These smart locks provide new forms comfort and efficiency to a part of the home that had experienced very few substantial changes. If the advent of smart locks has shown homeowners anything, it is that change is hard and laborious at times. However, in some cases, it can be worth it. But this only happens if you are adequately prepared to make changes. There are many homeowners who go out and buy smart locks before they even learn anything about them. They are simply enthralled by the idea of having a futuristic lock. In some cases, these homeowners are happy customers. Sometimes they find that having a smart lock is not necessarily an easy thing, especially if you are not well equipped to own one. There are many different smart locks, which might make it hard to buy the right one based on your needs and the type of home you have. For example, many individuals have a hard time choosing between the August and Kevo smart locks. This is the reason why homeowners have to make sure that they know what they are looking for in their smart lock. These features can range from battery power to the physical security features that the lock has, and some of these features are much more pertinent than others. For instance, the color of a smart lock is not a feature that homeowners should be paying attention to. The functionality of the lock is not dependent on whether or not the color of your lock matches your home’s exterior. Instead, focus on the performance of the lock, and the ways it can work to make your life easier, more convenient, and more secure. Let’s take a look at some essential smart lock features that homeowners should look out for when they embark on the journey of choosing a smart lock. The primary function of any lock is to provide some level of security. It is put in place to ensure that only authorized individuals have access to specific spaces at any given time. A lock is an integral part of home security, and it has been that way for years. The good thing about traditional locks is that their manufacturers didn’t have much to focus on aside from the aesthetics of the lock, so all their attention was drawn to making the lock as secure as possible. These traditional locks have measures in place to make them more resistant to lock bumping, lock picking, and other methods that can be used to bypass a lock’s security. However, when it comes to smart locks, manufactures have their attention divided between trying to make these locks easy, comfortable, and efficient to use. This means, more often than not, that the security aspect of the locks is left lacking, which doesn’t affect the manufacturer as much as it affects the homeowners. It is important for homeowners to look for smart locks with appropriate security features, or there will be no point in even purchasing a smart lock. The most secure smart locks will have features that make them resistant to methods of forced entry. In addition to this, people should strive to look for smart locks that favor the use of ANSI Grade 1 deadbolts. These deadbolts provide the maximum amount of security to your home and they stand up well to forceful methods of entry. Homeowners can also employ some DIY methods in conjunction with their smart locks to ensure that their homes are being kept as safe as possible. Purchasing a smart lock such as the August smart lock will allow you to customize the deadbolt that you use, which means you can select a Grade 1 deadbolt. Ensuring that your smart lock has the proper security features in place is critical. In addition to physical security features, homeowners should do some research into the cyber security measures that their potential smart lock has in place. 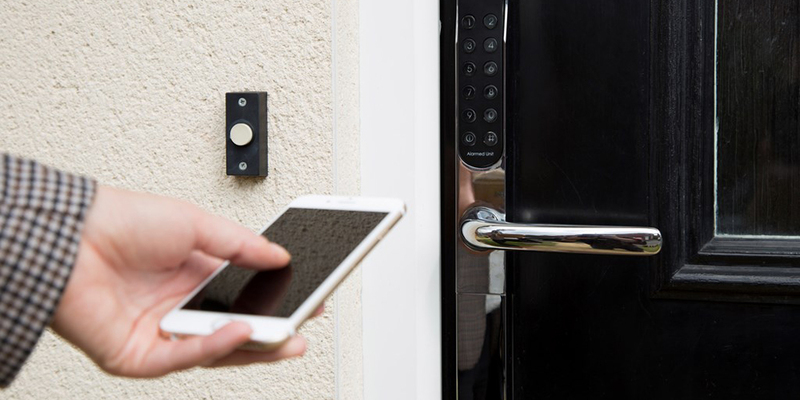 One of the many reasons why smart locks are becoming increasingly popular is because they can be used in conjunction with smartphones and other smart devices. However, this interconnectivity also exposes them to hacking and other malicious activities. It is important to look for a smart lock that has the proper authentication parameters as well as one that uses secure automation protocol. If any homeowners are unsure about the security features that their smart lock has in place, they can always talk this over with a professional locksmith that is more than willing to help them out. Traditional locks never had to worry about a battery running out of juice. Smart locks, however, require a constant source of power in order for them to function. This is the reason why most of them rely on battery power. It is crucial for homeowners to pay attention to the smart lock’s inherent battery. Some homeowners are under the impression that the battery issue might not be a big deal, but it could leave you in a tight spot if your lock happens to power down when you really need it. An important feature to look for in smart locks is the manner in which they consume their battery power, and how long the expected battery life is. For some of these smart locks, the automation protocols that they employ lend themselves to power conservation, like smart locks that utilize BLE (Bluetooth Low Energy). These kinds of locks are still able to perform the same basic functions and communicate with devices over certain distances, but they do this while conserving energy and remaining in a low power state, which allows the battery life to be conserved over time. The ability to have your smart lock communicate with other devices is one of the main reasons why it is becoming so popular. I mean think about it, which wouldn’t want to unlock their door with the press of a button, or be notified that they forgot to lock their door, which will then allow them to remotely lock the door from miles away. When the smart lock is working the way it is intended to, it pushes the boundary of the ways that technology and the home can come together. Being able to remotely connect with your lock gives homeowners a plethora of options that might also simultaneously increase the state of their home security. Remote connectivity ensures that you always know the current state of your smart lock no matter where you are. This comes in handy for instances where the lock might not have been engaged, or when it becomes compromised. Since remote connectivity allows users to know the lock’s current state, it allows them to plan accordingly and react in good time to ensure that nothing happens. Smart locks work exceedingly well on their own, but one of the things that make them even better is the fact that they can be controlled and monitored by accompanying smartphone applications. These applications are free to download, and easy to use. In addition to that, these applications give homeowners the chance to maximize all the features of their smart lock. The app connectivity feature is also necessary to aid in the communication of your device with other devices. Along with the many features that these kinds of applications will bring, they will also allow you to check the diagnostics on your lock and give you any pertinent information that relates to your lock. Many of these applications also give you real time notifications of anything that happens involving your lock. Many of these apps have a log to show whoever might have had access to your home at any given time. These applications go hand in hand with the remote access features, and they allow you to lock or unlock your door from any location, as well as always see whether the door is locked and secured or being tampered with. Essentially, these applications can put the entirety of your home security in the palm of your hand, and you can monitor your locks, DIY security cameras, and a host of other cool devices. The main counterpart to any good lock is a set of keys. These two things go hand in hand, and they always will. Traditional keys were hard to keep track of, especially if you lived with other people or wanted to give visitors access to your home. Many homeowners would remedy this problem by making spare keys so that they could give additional people access to their homes. This entire process drastically reduces the level of key control within a home. Key control is the term used to describe the numerous methods that people employ to ensure that only authorized people/personnel have access to certain keys. The higher your level of key control, the less likely it will be that an unauthorized individual might get a hold of your keys. A smart lock that has the electronic key feature will give you the ability to generate temporary keys so you can assign over certain pockets of time. These keys can also be reused by assigning them to different individuals. This process helps homeowners remain in full control of their keys at all times and it has no negative effect on the key control for their homes. If you want to revoke someone’s electronic key, you can simply do so through the mobile application or online, rather than having to hunt them down, have an awkward conversation and get your keys back. This feature also helps users track keys and/or delete unwanted users from having access to your home. An essential feature that homeowners should look for in a smart lock is it’s backup power capabilities. Unlike traditional locks, smart locks are not meant to be manually operated the way traditional locks are, rather they are meant to respond to a series of commands. This means that homeowners can open their doors with much more ease, without necessarily having to be in front of the door. It also means that there a host of new possibilities open to homeowners. However, lock is now dependent on a power source, and this could be the Achilles heel that decimates your home security. Imagine if you come home from work after a really long day, only to find that the battery within your smart lock has died. This most likely means that you are now locked out of your home and you have to resort to a different method of entry. There are some smart locks that still allow for the use of a traditional key in case the smart lock is not functioning the way it is intended to, but even then it will still deprive homeowners of the features that made them want to buy a smart lock in the first place. Homeowner’s need to pay attention to the advertised battery life of their devices and also need to look at what backup measures are in place for when the battery dies unexpectedly or if the lock is not connecting to your smartphone due to your Wi-Fi being down. These are important things to cover, not only because they will help you avoid lockouts, but because the security of your home hinges upon it. Imagine, if you will, that a burglar is able to disrupt the power to your smart lock or to the wireless receiver. There is a high chance that they will be able to exploit this. The most secure option that homeowners can employ involves making sure that their smart lock has some backup operational capabilities. These capabilities will not make your lock the weak link in your home security in case someone attempts to bypass it. No one likes something that does not play well with others, it makes things complicated and boring. The same concept can also be applied to smart locks. One of the most useful features that a smart lock can have is the ability for it to integrate with other smart devices and smart technology. This action enhances the smart lock’s features and also allows it to complete a series of complex tasks by working and communicating with other devices. 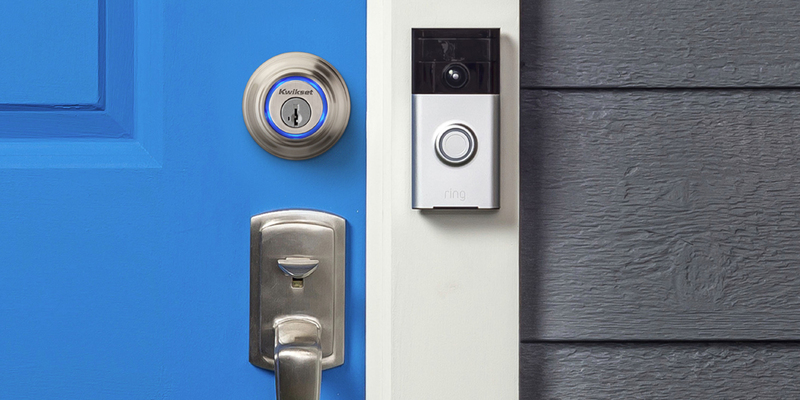 If your smart lock was able to communicate with your Ring doorbell, or your Nest Cam, it would greatly elevate your security. The surveillance camera within your home can be triggered to send an alarm notification anytime your smart lock is forcefully bypassed, and it can do many other things. Essentially, having a smart lock that can integrate with other devices is beneficial to you and your home. This is in no way or form a critique against the use of smart locks. Personally, I like smart locks, because I think they are a futuristic step forward in the right direction. However, manufacturers need to start putting a lot more thought into the security aspects of these locks in order to make sure that they are performing at their maximum potential. Locks are primarily meant to keep locations safe and secure, so if your smart locks are not fulfilling this primary function, then there is really no point to having them. That is unless you would rather have a lock that can communicate with your lights rather than keep your home secured. Homeowners should look out for locks that are security oriented. As has been stated above, there are some key features that anyone purchasing a smart lock should look out for in order to get a smart lock that satisfies their needs and keeps them safe. These essential features should not be overlooked, unless you want to spend the money getting one and then retrospectively trying to understand why it might give you some problems. Once again, this is not a bash or a rant against smart locks, but merely a guide to help homeowners choose smart locks that they will benefit from.